Expanding the independence of those with visual disabilities. Margaret and Roger Wilson-Hinds are wildlife fans. 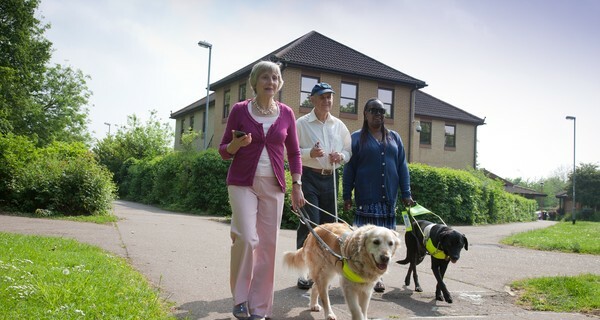 Although they are both visually impaired, they love walking in the country park near their home, which is teeming with local flora and fauna. The only problem is that due to their visual disabilities they frequently get lost, taking a wrong turn or missing the path that would lead them back home. Well, at least that was the case until one day in 2011 when they were struck that their touchscreen phone had the potential to help them find their way. They hired a developer to help them design what would soon become an incredibly useful app for the visually disabled. Named after Margaret’s first guide dog, Georgie is an app that harnesses the technological capabilities of smartphones to significantly expand the independence of those with visual disabilities. Using a smartphone camera, someone can snap a picture of an object, and Georgie will use object recognition technology to tell them what the object is. Want to check the colour of your socks? Georgie’s colour recognition system will ensure your outfit matches. Georgie will also automatically call a cab for you if you get lost and send it details of where you are based on GPS from your smartphone’s map. And how did Georgie help Margaret and Roger on their park walk? On Georgie you can record the direction and distance from landmarks in your surroundings, and when you walk past them on future occasions Georgie will tell you as you pass by, reassuring you that you are on the right track. Georgie has already begun to touch the lives of over two million visually impaired people in the UK. With demand for the app continuing to grow, this is just the beginning.